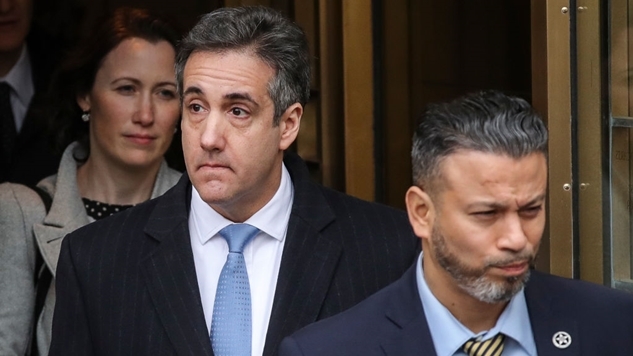 Michael Cohen is a glorified errand boy. His job was to wade around in the muck underneath the Trump Organization and hide as much criminality and as many criminal-adjacent acts as he could. While Cohen has demonstrated a pretty comprehensive knowledge of Trump’s sins, what he knows about the scope of Trump’s corruption pales in comparison to the man he named at least 35 times throughout yesterday’s extraordinary hearing that produced far more information than former FBI Director James Comey’s widely-anticipated testimony. Allen Weisselberg was an accountant for the late Fred Trump—that same Fred Trump who the New York Times revealed in an exhaustive Pulitzer-worthy investigation passed down a tax avoidance scheme to his son worth hundreds of millions of dollars. Allen Weisselberg was also the treasurer for the now-defunct Trump Foundation—a “charity” which voluntarily chose to shut down rather than face further legal scrutiny from the state of New York. Allen Weisselberg is the Chief Financial Officer of the Trump Organization, and just before Trump officially became president, Weisselberg was announced as the third trustee of the Trump Organization—along with the world’s two most pre-eminent failsons—one of whom’s signature appeared on a check along with Weisselberg’s allegedly “to reimburse [Cohen] for hush payments” to Stormy Daniels. In other words, no, the avalanche of “Allen Weisselberg is Trump’s worst nightmare” headlines today are not hyperbolic. This is where the public-facing investigation is headed next. If anyone knows where the bodies are buried in Trump’s byzantine financial crime operation, it’s the Chief Financial Officer whose time in the Trump orbit predates that of the Donald. No one has ever worked for the Trump Organization longer than Weisselberg has. Given the expansive scope of Trump-adjacent criminality uncovered by investigators, it is reasonable to assume anyone connected to this criminal web of lies and deceit has criminal liability themselves. Given Weisselberg’s past and what we know about the tax fraud scheme, combined with Donald Trump’s proclivity for trying to make a quick buck in any context, it seems impossible that Weisselberg wouldn’t have any criminal liability himself. That’s likely why he helped out a case against a bag man who spent much of his testimony yesterday detailing the work he did on behalf of senior Trump executives like Weisselberg (you don’t need immunity if you have no criminal liability). If Michael Cohen was being truthful to Congress yesterday, then Allen Weisselberg is about to become a central character in this ordeal. We are in the process of unwrapping a conspiracy predicated on money, and the only person who could conceivably know more about the Trump Organization's money is Donald Trump—and he doesn't know anything about anything. There is likely no one more knowledgeable about Trump's financial blueprint than Allen Weisselberg, and we now have congressional testimony from a man in Trump's financial orbit that can spur a thousand subpoenas. Cohen's exchange with Ro Khanna no doubt set off alarm bells among Trump's legal team. Rep. Ro Khanna (D-CA): "Are you telling us, Mr. Cohen, the president directed instruction in conspiracy with Allen Weisselberg and his son Donald Trump, Jr. As part of a criminal conspiracy of financial fraud, is that your testimony today?" As Alexandria Ocasio-Cortez, Carolyn Maloney and many other Democrats not named Debbie Wasserman-Schultz demonstrated yesterday, the point of these congressional interrogations is to dig up as much information as possible. Cohen’s testimony will form the basis of subpoenas sent out to other Trump-adjacent figures in order to bring them in front of Congress to shed additional light on the breadcrumbs left out by Michael Cohen (this is why DWS’s “please speculate” line of questioning to Cohen was so pointless—imagine forming the basis of a subpoena around the “speculation” of a man who already pleaded guilty to lying to Congress). Things are going from bad to worse for our criminal president. The biggest question in all of this is not whether Trump committed crimes—as Mueller and SDNY combining to name “Individual 1” 37 times in 37 pages of Cohen crimes proved that Trump is at the center of the investigation—but whether we can bypass the awesome powers of the presidency to charge him with a crime. We genuinely do not know if this is even possible, and the only legal guidance we have on this subject is a single DOJ memo from the Watergate era. This is a stress test for democracy, and if we cannot find a way to punish an immensely powerful criminal individual and their sycophants in government, one has to wonder if our constitution is really all that it’s cracked up to be.